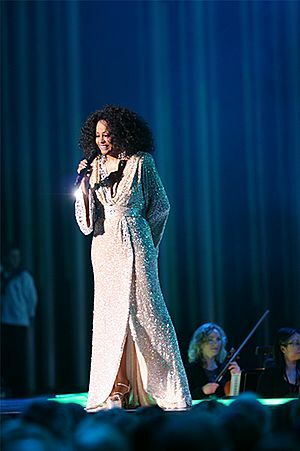 Diana Ross is a famous American soul and pop singer. She was born in 1944 in Detroit, Michigan. Ross worked as a secretary for Motown Records in Detroit. She first became successful with a Motown group as The Supremes. The Supremes were the most successful act on Motown in the 1960s. They sold millions of albums and made it possible for other African American musical acts to become famous with international audiences. Diana Ross had a successful solo career from the 1970s on. She is a high-paid concert performer. She also starred in three movies: Lady Sings The Blues, the story of the blues singer Billie Holiday; Mahogany, a story about a fashion designer; and The Wiz, an African-American version of the book The Wonderful Wizard of Oz. Ross has five children and two grandchildren. 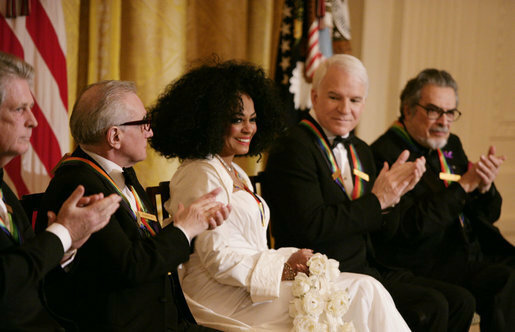 Diana Ross is applauded by her fellow Kennedy Center honorees as she is recognized for her career achievements by President George W. Bush in the East Room of the White House Sunday, December 2, 2007, during the Kennedy Center Gala Reception. From left to right: singer-songwriter Brian Wilson; filmmaker Martin Scorsese; Ross; comedian, actor and author Steve Martin, and pianist Leon Fleisher. Diana Ross Facts for Kids. Kiddle Encyclopedia.